We’re holding the 8th annual Festival of Fruit on September 13, 2014 from 10:00AM – 2:00PM at the Carkeek Park Environmental Learning Center. Events will include cider pressing and tasting, live music, activities for kids, guided tours of the historic orchard and more. In addition to the regular Festival, we’re excited to host a presentation on making cider from 2:30PM to 4:00PM in the ELC. Experts including the renowned Dr. Bob Norton, retired research scientist from WSU Extension in Mt. 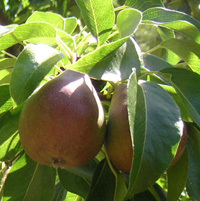 Vernon and Shaun Shepherd from Portland’s Home Orchard Society, will give talks on apple varieties and identification. Visitors are encouraged to try out making cider the old-fashioned way, with a hand cranked cider press. Visitors are welcome to donate homemade pies. Fresh warm cider and slices of homemade pie will be available at a nominal cost, with proceeds to support ongoing maintenance of the orchard. Expert volunteers who have painstakingly restored the orchard will lead tours, pointing out the heirloom varieties that are going strong as well as younger trees and newly planted grape vines. Visitors will have the chance to taste heirloom apple varieties that are grown in the orchard. Little ones will enjoy organized arts and crafts activities. Will Morgan will be playing my acoustic and getting a wail on about 10:30 to 12:00..
Kelly Blanchard’s band Blue Star Creeper will play Noon to 1:30’r so.. I just saw this and wish I’d seen it earlier! I’ve been trying to find Rhode Island Greening apples in this area for about fifteen years. Is there a chance any are left?